Multiply Your Market Value & Income a Hundredfold / When was the last time you were invited into a $1/Million to $2/Million, or $4/Million to $6/Million dollar home or higher to give a listing presentation and told by the seller that they were only taking the time to see you as a courtesy because of your Marketing Partner's kind request and that they've already interviewed the top agents in their area and have decided whom they are going to list with? They then kindly inform you that they've already heard everything agents have to say about sales and marketing and that they're basically all the same, so unless you really have something special to offer they don't want to waste your time. Thank you for telling me that, I'd like to start with this. It’s my intention to get you more money for your house than anyone believes possible in today's market and, possibly, more money than anyone has ever gotten before for a house like yours in this entire area or neighborhood; and it’s my intention to do it quickly: to list, sell and close in ninety-days irrespective of your experience to date or what you may personally think or feel about the market. To do that I will have to do some Extra-Ordinary-Things and few Ordinary-Things, but in an Extra-Ordinary-Way. The path to that is through The Pillars of Success (1) Strategic Planning (2) Intentioned Activity and (3) Records to Substantiate Effort and Progress. (1) Our Seller Services Portfolio is expressive of this. It’s a pictorial display of the principles that underscore our Twelve-Step Marketing Strategy, today's talking points, an outline of the traditional things we do and the game changers that turn slow-sale real estate, usually an expired listing, into fast-sale real estate. (2) The Strategies underscore the action-oriented tactics we define and execute to make things happen outlined within a personalized Fast-Sale Marketing Worksheet we create for your property alone. It’s on this worksheet that we keep records of activity to substantiate effort and progress that we report to you – in Writing – every week. (3) The Strategies, Tactics, and Action Plan are all followed by the money: a transaction and Transaction Worksheet that once begun is completed at the close of a smooth, trouble-free escrow. Page through the Portfolio and Worksheets, if you like, if something grabs you or catches your eye, let me know. You slide a duplicate oversized 45/page full-color portfolio and set of worksheets to each home owner present and though, sharing the following, patiently wait for their attention to return to you, sometimes quickly, sometimes thirty to forty-five minutes later. Each is a Supernova of Sales Activity made up of Bold and Enterprising Programs that move through the market like Juggernauts: unstoppable forces that crush whatever are in their path always focused on doing First Things First and on keeping The Main Thing, The Main Thing. The Main Thing of course is getting your count up, meaning your body count, targeted buyers that preview your property per the Secret of Success, Item #2 on the Talking Points Worksheet. Knowing exactly who your buyer will likely be (a buyer predisposed to region, area and locale) and what to expect per The 49-to-1 Rule (that you can expect to receive at least one offer that can be negotiated to success out of every fifty buyers that preview your property) is paramount to success. All programs must follow these foundation principles. You have to know where you're going to get there. And, possibly, we’ll look over my unique Sale-by-Auction program. Utilizing it it’s not uncommon for a Home Owner to put a home on the market by auction with me that has been for sale for six months, a year or even longer and then to sell it within six-to-eight weeks irrespective of the price of the home. With this program I give Sellers an edge on competition in the market by making their home the first one a buyer will look at if they want to buy in their area: the value-buy message inherent to selling by auction demands that. We sometimes use it for the reverse purpose: to sell for more money than the asking price. By executing the programs shown on these outlines – one following another until we get the results we want – we’ll draw both Buyers and Agents to your property like metal shavings to a powerful magnet in greater numbers than any other cookie-cutter program on the market. Did I say cookie-cutter? I've Come Up with Say About That. After deciding on a price, we can look over the highlights of my program (1) The Secret of Success (2) Branding (3) The Money Door (4) Multilevel Advertising (5) World Outreach Marketing (6) Sale-by-Auction Marketing and anything else that grabs you or catches your eye as we talk. What’s next, of course, is the completion of a listing agreement with compensation established at six-to-eight percent of the sales price, because of one or more of your groundbreaking programs that require this, and a term of six-months to one-year. And, just as predicted, you list, sell and close this property all within ninety-days yourself to earn a whopping single commission of $240,000 for just one listing and one sale. It's an exciting scenario I have played out many hundreds of times with both Sellers of individual custom homes and estates and Builders of major new home projects. Sure enough it is "My" story but as the author I can write you in to share it with me from here out as the protagonist or hero of each adventure. It can be "Your" story too, but you also will have to do First Things First and keep the Main Thing, the Main Thing. Many great goals are not reached in real estate because Brokers and Agents just don't do this. The Main Thing, of course, is being Associated or Affiliated with a listing program that works. Listing is Job One. We in the Fellowship do not chase REOs, Short Sales or NODs, nor do we seek discount-oriented buyers; instead we seek high quality equity-positioned listings at the Top or High-End of the market, qualified high-end buyers and quick closings. Success at the Top of the Market. An Apprenticeship to a Work / The Real Estate Fellowship, initially, is a two person (you and I) team-oriented apprenticeship to a work for both Marketing Partners and Protégés and a retooling platform for Brokers and Agents long in the business but not working at the "Top" or high-end of the market or by cause or circumstance not in an effective listing program at this time. 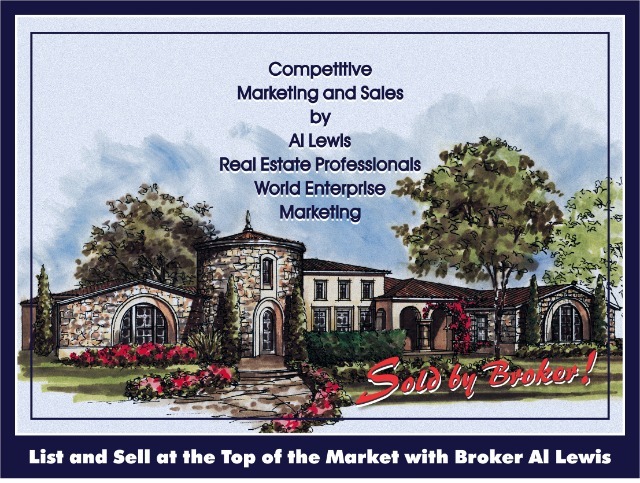 Working at arm's length with me in the field, in houses, listing and selling in the high-end you will learn firsthand by direct observation and -- The Doing -- an easier, more pleasurable, more efficient way of getting and doing business at the top of the market. Easy only because I have laid the groundwork, developed the programs, executed them to fulfillment many decades running and have created a structure for sharing my program and success -- Inherent of It -- with you now. Confidentiality is the Hallmark of this Relationship / Top producing brokers and agents you would never suspect, associated with just about every standout real estate company and franchise giant up and down the southern California coastline, are affiliated with me and The Real Estate Fellowship for the listing and sale of residential real estate at the “Top” of the market. Who, after all, at whatever level of success they have enjoyed in real estate wouldn’t, still, want to do better in affiliation with a professional marketing company and marketing professional to grow their inventory of high-end listings? are associated. I am referenced by addendum as the Co-Marketing Partner and specifically not the co-listing agent; and, though instrumental in gaining listings by means of (1) A fast-sale marketing strategy with game-changer programs (2) A personal in-house presentation, and (3) Though responsible for carrying out the unique features of marketing that both rouses seller interest in listing with us and is the cause of buyer activity on listings taken, I remain (4) Largely a background actor known and seen by few. Confidentiality is the hallmark of this relationship. will bypass that curve completely (1) No down time sitting through endless hours of high-cost in-office training (2) No high-cost farming (no farming) (3) No dragged out business development program (4) No buying of leads or bench ads, or magazine ads, or online profiles on Zillow or Trulia or dot.Realtor or Realtor.com (5) No Google Adwords, Yahoo or MSN pay-per-click advertising campaigns (6) No high-cost website or website optimization schemes, and (7) No telemarketing or door-to-door prospecting. You will bypass these things completely, yet have high-end listings on the market by the end of your first month working with me and every month after if wanted. You will start at the "Top" and stay there. The Top Job in Real Estate / At this point you must be asking yourself how this is possible; how you can build a career in real estate listing and selling at the top of the market without doing the things everyone else does as shown above; how this can be done nearly cost free and within only thirty-days of starting. The answers are found within a program introduction, job description and start-up pro forma titled The Power of One: The Top Job in Real Estate. To receive this, stop here and send a request by email direct to / AlLewisMarketing@gmail.com. Sidebar / Talent and skill you have in abundance, I can assume this, but they must be channeled to be of value in the marketplace. To soar listing and selling real estate at the top of the market you have to have a story that makes you interesting, not a run-of-the-mill franchise rubber stamp, but a standout persona that satisfies the demands of a high-end selling situation worth paying attention to. In affiliation with me you will have this. You are a concerto in the making, a large scale musical composition for a solo instrument accompanied by an orchestra, play your music and be recognized. Get to Where You Want to Go Quickly / The fastest way to experience a quantum-leap in your success and income is to work side-by-side an active hands-on high-end listing and selling Broker within a true Journeyman/Apprentice listing program using Broker's program and tools. In principle, a quantum-leap is a change in status from one set of circumstances to another set of circumstances that takes place immediately without passing through the circumstances in between. Then, as your experience in the market grows, your efficacy is substantiated -- your ability to produce results -- and your expertise is broadened you can advance to Journeyman status and independence as a high-end sales and marketing Broker or Agent that will earn you respect, a place in an unbounded, non-local market that stretches the California Coast, Inland Areas, Mountains and Desert, and a recession-proof income that will be envied by all. If you haven't yet gotten to where you want to go in real estate, consider letting go of means and methods that may be holding you back and, instead, walk in sync with someone walking-the-walk and talking-the-talk. What surer way to succeed can you devise than that? The Best of Both Worlds for Both Brokers and Agents / Whether an independently active Broker or a Broker or Agent affiliated with a real estate company you can work inside this program. The program of The Real Estate Fellowship does not require that you change affiliation and sign a Broker-Associate Licensee Agreement with me, the Fellowship or my real estate company, Real Estate Professionals Allstate Marketing; nor does it imply a job or association at the expense of your independence or affiliation to participate though listing and selling under the Real Estate Professionals banner is an open ended possibility. It is a unique opportunity to grow your business by working in a collaboration with an experienced Broker, a true vet that lists and sells at the top of the market. Imagine -- in addition-to or instead-of what you are currently doing -- earning commissions every month on sales priced at two-, three-, or four-million dollars or more upon which we -- in collaboration -- receive the listing and sales fee: six-percent of the sales price. You would earn your share for your contribution to the overall sales and market effort (defined during a confidential interview). In the long run I expect the income of each Fellow to exceed $1,000,000 per year. That is, after all, only ten $100,000 commissions or twenty $50,000 commissions a year and this we can do. Let's Go to The Movies / I am inspired by the way both people and companies that make up the movie industry -- an industry populated by people with monumental egos, deep pockets, and enormously successful companies with international reach -- are able to cooperate for the co-financing, co-partnership and co-production of a single film. I recently watched the co-production credits of these highly successful independent film makers cross the screen with their splash-video-logos at the beginning of a single three-hour movie: Dream Works, Imagine Entertainment, United Artists, Paramount Pictures, American Zoetrope, Blue Sky Studios, Columbia Pictures and Twentieth Century-Fox. Then I watched as twelve different Executive Producers were listed and eighteen Associate Producers all for the same single film. Yet we, in real estate, don't have structures for even two independent Brokers from different companies to share expertise, effort and resources for the listing and sale of just one house. Consider The Real Estate Fellowship a first for doing just that. The Fellowship is an Association of Brokers and Agents independent of each other combining expertise, effort and resources toward a common goal; it is an association and a Business for listing and selling residential real estate at the Top or High-End of the market. Generally, individuals with a Real Estate Broker's or Agent's License, Attorneys, and real estate oriented Corporate Entities with a Licensed Officer such as Lenders, Banks, Builders and Investment Trusts may join. Additionally, an independent Real Estate Company, its Representative Staff and Broker-Owner may join the Fellowship as a single unit under the authority of the Broker-Owner or authorized representative. See / TheWealthAgenda.com. The business and mission of the Fellowship is the listing and sale of residential real estate at the Top of the market under my guidance and banner of Real Estate Professionals Allstate Marketing with local identification though not required; commission sharing with Fellows that collaborate to fulfill the mission; and the empowerment of Fellows to experience Success, Well Being, Stability, Power and Money through real estate. Mental Equivalents / If we are to draw from Life what we want, we must first think forth what we want into Life. Life can only mirror what we think. This is called mutual-arising. In order to have success in the high-end you must first conceive it in your thought. This is not because we are creators, but because the flow of Life into experience through us can only take the form we give it. If we want a thing we must have within ourselves the mental equivalent before we can either get it or do it if action is part of the equation as it most always is. The Real Estate Fellowship, its program, tools and structure for listing and selling at the top of the market is the image -- The Mental Equivalent or Bigger Thing -- and path that can multiply your market value and income a hundredfold; but you must act for it to happen. Introductory Pro Forma / Please respond by email to request and receive a program introduction, job description and start-up pro forma titled The Power of One: The Top Job in Real Estate. You'll always be glad you took action on this. This detailed article will define for you exactly (1) How to break-into and sustain listing and sales success at the "Top" or high-end of the market under the umbrella of The Real Estate Fellowship (2) It will help you determine your fit (3) It will define for you why it is recession-proof, free of competition and Top of The Mark. After looking this over, you are cordially invited to call direct to arrange a personal interview and introductory/sign-up meeting. Please visit all the links and websites shown on the sidebar to the left prior to calling. Working with me you will have the -- Top Job -- in real estate substantiated by a lifestyle exemplifying balance and an income exemplifying wealth and status.